The goal of our program is to create intelligent instructors who are capable of entering the workplace, and learning how to teach every single body type, regardless of limitations or restrictions. Boditree graduates are in high demand because of the teaching and assessment skills we share with our students, however our goal is that graduates choose to stay and work with us here at Boditree. Included in this program is a full apprenticeship, teaching skills within the Pilates studio, both in designing new workouts, and in teaching existing clients who train at Boditree. Boditree Pilates Online Education at Thinkific.com! We are excited to launch our online education program! Using Thinkific.com, Boditree Pilates and Healing online education is available now. These online courses are meant to give fellow instructors and movement therapists an opportunity to study with Risa Mathews owner and founder of Boditree Pilates & Healing, without having to travel to Vancouver. Risa holds a BA from Simon Fraser University (1990) and an MA from Macquarie University (1995), and has a background in dance, aquatics, teaching, publishing, and public speaking. Risa Mathews, owner and founder of Boditree Pilates & Healing has successfully integrated a number of healing modalities into the Pilates environment, which has shown to assist participants in managing pain and better prepare them for physical exercise. Risa has created, published, and trademarked a number of protocols that will now be shared via online course offerings. Risa has researched and created these protocols to help manage the following, but not limited to : chronic pain, injury, rehabilitation from surgery, plus a multitude of conditions such scoliosis, Parkinsons, MS, learning disabilities, joint replacement, emotional trauma, post-surgical rehabilitation, and pre and post-natal conditioning. Great work today with this strong guy, he makes it look easy! Long Box Pulling Straps, its a tough one that many make mistakes on, mostly because of breath. At Boditree Pilates we want to make sure our clients clearly feel and understand how breath guides the work. By doing so, we enable the body to find the right planes and lines. From an instructional point of view, It’s critical to break down these variations so that the explanation can guide the best result. It is amazing how even our strongest clients are continually challenged by the ingenuity of a Pilates workout. Boditree Pilates in Kitsilano, Vancouver offers customized workouts so that every client is doing what is appropriate for their body, needs and goals. You will see people of all levels of strength and conditioning working out together, each one doing their own custom program and working towards getting the exact results they are looking for. How is this different from the usual Pilates studios that feature group led programs? At Boditree Pilates every client is challenged to meet their own goals working with both the strengths and weaknesses they bring in. With a customized program, anyone can be challenged, regardless of their starting point. With constant instruction while you workout, you are kept on form and maximize your results. Try it out, call us at 604-736-2634 to set up your intro sessions today! Everyone deserves to benefit from the freedom of movement Pilates provides, regardless of where they are at in their lives and bodies. Some days we are capable of performing like a star, other days we are not at our best. 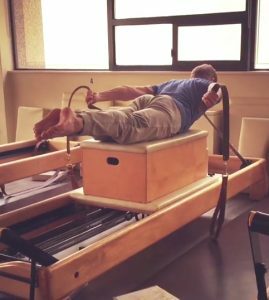 This is what Boditree PIlates Vancouver excels at — custom designing programs to assist your body to heal and to achieve it’s finest based on where you are in your mind/body right now. At Boditree Pilates and Healing we modify and make your exercises meaningful for you, and modify as much as is needed, so the body can strengthen and tone no matter what restrictions you may have. We work closely with you and as your ability to accept new challenges arises we adapt and update your program to make sure it is working for you. This way, when the day arrives that different repertoire is possible, the foundation had already been developed. You are ready and you are doing it! Pilates is not only for capable movers, indeed, it is for ALL! G5 percussive massage is an excellent and efficient way to release muscle tightness, improve fascial circulation, tone the body and improve lymphatic drainage. The G5 Percussive Massage System is used both by top models in France for toning & cellulite reduction, and by professional league athletes (NFL and MLB) for post game and injury recovery! The G5 allows for a deeper massage in a shorter period of time than traditional techniques. With it’s quiet yet powerful percussive force, you can feel the tension melting away soon into the treatment. Afterwards you will fill energized, toned and relaxed. Used in the health industry for over 50 years, G5 treatments are effective in reducing lactic acid, flushing lymphatic tissue, and for faster recovery from injury. Triathletes, cyclists, marathoners, team sport and weekend warriors? Try the G5 for greater recovery and treatment of any strains and stresses. The G5 is excellent for treatment of postural and occupational aches and pains especially in conjunction with a customized Pilates workout. This magnificent tool features an assortment of attachments used without the need for oils or linaments. The treatments were developed by Risa Mathews of Boditree Vancouver in coordination with Boditree’s in-house Chiropractor, Dr. Randy Zindler. Our clients love the benefits of G5 treatments in combination with their custom designed Pilates workouts. You can also add on a session in our infrared sauna to deepen this restorative and relaxing experience. At Boditree Pilates and Healing, we offer two options for G-5 Percussive Massage in our private treatment room. A 25 minute session and a 50 minute session. Also, all Pilates apparatus clientele receive their first 25 minute session at no charge! G5 treatments are most effective following a workout or sauna. To book a session, please see reception or call the studio. At the beach, hotel room or ski hill: A pilates workout designed for travel & vacation goes where you go! Pilates can provide you with a killer workout you can do to maintain your fitness and recover from a long flight right in the comfort of your room or on the beach :-). Boditree staff have been designing travel routines for our clients for more than 10 years. We are happy to help you incorporate Pilates fundamentals into a routine that can be practiced anywhere you go, no equipment required! Visiting Vancouver and want to work out privately or in a group? Give us a call and we can discuss the options that will work best for you. Contact us by email or phone at 604-736-2634.